Once Bhimasena asked the great sage Shrila Vyasadeva, the grandfather of the Pandavas, whether it was possible to return to the spiritual world without having observed all the rules and regulations of the Ekadashi fasts. He said that he couldn't live without eating, because hunger was unbearable to him. He asked him for a solution to obtain the same merits without fasting. Vyasadeva replied, "Without drinking even water, you should fast on the Ekadashi that occurs during the light fortnight of the month of Jyeshtha (May-June) when the sun travels in the sign of Taurus (Vrishabh) and Gemini (Mithun)." According to learned personalities, on this day one may bathe and perform achamana for pratiprokshana purification. But while performing achamana one may drink only that amount of water equal to a drop of gold, or that amount it takes to immerse a single mustard seed. Only this amount of water should be placed in the right palm for sipping. If one drinks more water than this, he might as well have drunk wine. One must certainly not eat anything, for if he does so he breaks his fast. This rigid fast is in effect from sunrise on the Ekadashi day to sunrise on the Dvadashi day. If a person endeavours to observe this great fast very strictly, he easily achieves the result of observing all twenty-four other Ekadashi fasts throughout the entire year. On Dvadashi one should bathe early in the morning. Then, according to the prescribed rules and depending on his ability, he should give some gold and water to worthy brahmanas. Finally, he should cheerfully honour prasadam with a brahmana. Oh Bhimasena, one who can fast on this special Ekadashi in this manner reaps the benefit of having fasted on every Ekadashi during the year. There is no doubt of this. Oh Bhima, now hear the specific merit one gets by fasting on this Ekadashi. The Supreme Lord Keshava, who holds a conch, discus, club and lotus, personally told me, ‘Everyone should take shelter of Me and follow My instructions.' Then He told me that one who fasts on this Ekadashi, without even drinking water or eating, becomes free of all sinful reactions, and that one who observes the difficult nirjala fast on Jyeshtha-shukla Ekadashi truly reaps the benefit of all other Ekadashi fasts. Oh Bhimasena, in the Kali-yuga, the age of quarrel and hypocrisy, when all the principles of the Vedas will have been destroyed or greatly minimised, and when there will be no proper charity or observance of the ancient Vedic principles and ceremonies, how will there be any means of purifying the self? But there is the opportunity to fast on Ekadashi and become free of all one's past sins." 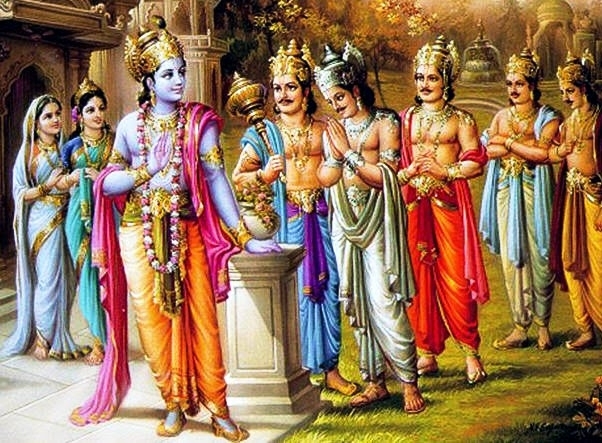 When the other Pandavas heard about the benefits to be gained by following Jyeshtha-shukla Ekadashi, they resolved to observe it exactly as their grandfather Shrila Vyasadeva had explained it to their brother, Bhimasena. All the Pandavas observed it by refraining from eating or drinking anything, and thus this day is also known as Pandava Nirjala Dvadashi (technically it is a Maha-Dvadashi). Shrila Vyasadeva continued, "One who on this day gives a brahmana a water pot, an umbrella, or shoes surely goes to the heavenly planets. Indeed, he who simply hears these glories also attains to the transcendental abode of the Supreme Lord, Sri Vishnu. Whoever performs the shraddha ceremony to the forefathers on the dark-moon day called amavasya, particularly if it occurs at the time of a solar eclipse undoubtedly achieves great merit, but this same merit is achieved by him who simply hears this sacred narration – so powerful and so dear to the Lord is this Ekadashi. Oh Bhimasena, after this Ekadashi fast and donating the recommended items according to his ability, the devotee should feed brahmanas and thereafter honour prasadam silently." Thus ends the narration of the glories of Jyeshtha-shukla Ekadashi, or Bhimaseni-nirjala Ekadashi, from the Brahma-vaivarta Purana.